Explore Argentina, the land of legendary gauchos, energetic tango dancers, abundant wildlife, massive glaciers, and spectacular landscapes, with a unique Discover Argentina Package. Experience this thrilling country at the edge of the world by starting in the “Paris of the Americas,” the cosmopolitan capital Buenos Aires. Continue on to the magical Iguazú Falls, composed of over 270 waterfalls merging together to cascade down the Iguazú River’s deepest cataracts. Then, you’ll discover the best of Patagonia with the next three destinations. 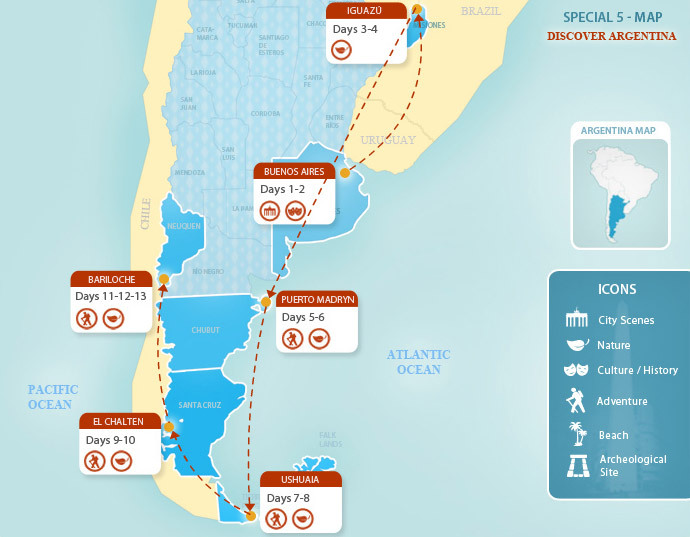 Revel in the abundant wildlife of Puerto Madryn, perhaps catching sight of southern right whales; head down to Ushuaia, the world’s southernmost city, to trek through Tierra del Fuego National Park and hike the impressive Perito Moreno Glacier; and conclude your Argentina tour in Bariloche, the ski capital of Argentina. Upon arrival in Buenos Aires you will be greeted by one of our Argentina For Less representatives and escorted to your confirmed Buenos Aires hotel. With so much to do and see, read our Buenos Aires Guide for sightseeing and dining suggestions. Transfer from your hotel to the airport and flight from Buenos Aires to Puerto Iguazú. Discover Argentina’s most spectacular natural phenomenon on a thrilling full-day Iguazu Falls tour. Transfer from your hotel to the airport and flight from Puerto Iguazú to Puerto Madryn via Buenos Aires. Upon arrival in Puerto Madryn, you will be greeted at the airport and taken to your confirmed Puerto Madryn hotel by an Argentina For Less representative. The afternoon and the evening are free for you to explore and enjoy Puerto Madryn at your leisure. Today you’ll enjoy an exciting nature tour on your Patagonia travel adventure with a visit to the wildlife-filled Peninsula Valdes. On this tour, you will get the chance to admire a large variety of land and marine fauna that are very rarely seen together in the same place. The tour will include visit to the Center of Interpretation of Istmo Ameghino, a sea lion colony on Punto Pirámides, as well as salt lakes and sea elephant colonies in Punta Delgada. Other highlights of this tour include Caleta Valdes and Punta Cantor, where you’ll have the opportunity to visit the Lighthouse of Punta Norte. If you visit between June and December, you can also take an optional whale watching tour (ask your travel advisor to customize your tour). After your tour of Peninsula Valdes, you will be taken back to your Puerto Madryn hotel and have the remainder of the day to relax and explore the city on your own. Transfer from your hotel to the airport and flight from Puerto Madryn to Ushuaia. Upon arrival in Ushuaia, Argentina, often called the end of the world for its extreme southern location, an Argentina For Less representative will meet you at the airport and take you to your confirmed Ushuaia hotel. You will have the rest of the day to settle in, rest, and start exploring Ushuaia on your own. Read our Ushuaia Travel Guide for ideas on what to do and where to eat in Ushuaia. Get ready for an exciting full-day Ushuaia tour taking you to the most beautiful areas surrounding the city. You will meet your guide at your hotel for the drive to the magnificent Tierra del Fuego National Park. Once you reach the entrance, you have the option to take a 45-minute train ride aboard the Tren del fin del Mundo (Train at the End of the World) that will take you on a wonderful journey across the Tierra del Fuego park. The train is composed of replicas of old wagons that used to carry prisoners who came to work in the park. During the tour you will have the opportunity to walk around beautiful lagoons and stop at several viewpoints of the Beagle Channel in Ensenada Bay. The tour continues around the main roads of the National Park allowing you to observe the mountains, rivers, lakes, and forests. On the way to Bahia Lapataia you will see peat bogs and beaver dams before continuing on to Laguna Verde. From there, you will take a short hike to Laguna Negra or take the path toward Bahia Lapataia, where you will come upon an archaeological site and the start of the Pan American highway that travels all the way to Alaska. On the way back to Ushuaia, you will also stop at Rock Lake. After the tour, you will be taken back to your Ushuaia hotel and have the remainder of the day to enjoy at your leisure. Transfer from your hotel to the airport and flight from Puerto Madryn to El Calafate. Upon arrival, you will be met at the airport by one of our Argentina For Less representatives and taken to your confirmed El Calafate hotel. Enjoy the remainder of the day at your leisure in El Calafate. We suggest a visit to the Nimes Lagoon at sunset to watch the birds settling in for the night. Enjoy an early breakfast at your hotel before departing for the famous Perito Moreno Glacier on a unique Patagonia travel experience. On the 48-mile ride (80 kilometers) to the glacier, you’ll pass the southern bank of the glistening blue Lago Argentino, populated by colorful flamingoes, black-necked swans, and coots. You’ll also see several berry farms and estancias. You will have the opportunity to stop on the way and enjoy the wonderful views. When you arrive at the foot of the Perito Moreno Glacier, you’ll have several hours to explore its trails and footpaths at your own pace, accompanied by an expert guide, until you reach the Observational Panoramic Point from where you can appreciate the grandiose vastness of the glacier. In the afternoon, you can either choose to continue exploring the area on your own or take a 1-hour boat tour along Lago Rico to take in the grandeur of the glacier from its most imposing edge on the north wall. You will then return to your comfortable El Calafate hotel and spend the remainder of the day at your leisure. Transfer from your hotel to the airport and flight from El Calafate to Bariloche. Upon arrival in Bariloche you will be met at the airport by an Argentina For Less representative and taken to your confirmed hotel. You’ll enjoy the remainder of the day at your leisure, with plenty of time to unpack, settle in, and explore the area near your hotel. For dining ideas, check out our Bariloche Travel Guide. Today you will enjoy a half-day Bariloche tour with an expert English-speaking guide. You will first head to the coast and drive alongside the glistening Nahuel Huapi Lake until you reach the base of Cerro Campanario, from where you will have beautiful views of the Nahuel Huapi and Perito Moreno lakes, El Trebol lagoon, and the San Pedro and Llao Llao peninsulas. From there, you can also admire Isla Victoria as well as the Otto, Lopez, Goye and Catedral Hills. The second part of your tour will take you to the beautiful Llao Llao area where you can see the St. Edward’s Chapel, a true architectural jewel, and Puerto Pañuelo (Handkerchief Port) on the Nahuel Huapi lakeside. Continuing on, you will drive and over the Angostura bridge towards Lopez Bay, at the foot of the Lopez hill. Then you will cross the bridge on Lake Moreno’s narrow point and continue along the side of El Trebol (Clover) lagoon. After the tour, you will be taken back to your Bariloche hotel where you can enjoy a relaxing evening at your leisure. Transfer from your hotel to the airport and flight from Bariloche to Buenos Aires. Alternatively, you can browse our other exciting Bariloche tours and activities to keep exploring this area or check out our full range of Argentina travel destinations to explore additional Argentina vacation options. Ideally located minutes away from Iguazú Falls and downtown Iguazú, Loi Suites is surrounded by the characteristic lush vegetation and wildlife of this tropical region. Indulge in a luxury stay at this excellent 5-star hotel where attention to detail and personalized service are the rule. With more than 160 luxurious rooms available, all fully-furnished with a minibar, wireless Internet access, and a security deposit box, no expense is spared to make your stay as comfortable as possible. After a long day of visiting the falls or the jungles of Puerto Iguazú, guests are invited to use the 800 square meter swimming pool, the recreation lounge or have a delectable dinner at one of the hotel’s two exquisite restaurants. Located in the heart of Puerto Iguazú, a few blocks from Avenida Costanera, Jardin de Puerto Iguazú offers guests a great range of excellent services. Featuring 30 comfortable and fully equipped rooms, some dotted with views of the garden and swimming pool, Jardin de Iguazú strives to make guests feel at home. This beautiful hotel is complete with free wireless internet, bar service, and swimming pool where guests can enjoy relaxing hydro-massages. The hotel’s central location makes for a short walk to shops and restaurants, and the city’s main attractions to enhance your Iguazú travel adventure. Hotel Territorio in Punta Cuevas, Puerto Madryn, is a top-notch boutique hotel with splendid views of the Gulfo Nuevo. The hotel’s prime location and opulent amenities are well complimented by the attentive, friendly staff. 36 guest rooms are carefully decorated with modern touches, and all have views of the sea, plus mini-bars, dressing rooms, TV, telephone, safe-deposit boxes, energy controls, and card key door locks. There is also a gym and spa with Jacuzzi, Scottish shower, massages, and special treatments available. The hotel’s restaurant serves exquisite Patagonian cuisine and the wine cellar is well stocked with Argentina’s best wines. Located right on the beach in Puerto Madryn, Hotel Peninsula Valdes is a warm and inviting beach house hotel, where each and every detail is carefully considered to make your Argentina vacation as comfortable as it can be. The 76 ample rooms offer gorgeous sea views, air conditioning, cable TV, telephone, internet access, and spacious bathrooms with hair dryers. The hotel also features 24 hour room service, a full service bar, a laundry service, safe-deposit boxes, computers with internet access, and a spa with a gym, sauna, Jacuzzi tubs, and health care professionals to help you relax and enjoy your vacation to the fullest. The stylish Hotel Tolosa is ideally located a mere two blocks from the waterfront. It features comfortable guest rooms of varying sizes, including triple and quadruple rooms. Some of these rooms include hydro-massage, mini bars, and many more great amenities. Standard services include buffet breakfast, internet, and even a bicycle to take self-guided tours around the waterfront or the city. The hotel’s cafeteria serves delicious light snacks, and other amenities include 24 hour room service, parking, dry cleaning and laundry, babysitting, safe-deposit boxes, and luggage storage. The Hotel Posada Los Alamos is a family-owned business beautifully situated along five acres of lush gardens along Lago Argentino in El Calafate. Its excellent services include a golf course, a full workout gym, an indoor swimming pool and spa, a library, medical facilities, secretarial services, safe-deposit boxes, mini bars, childcare services, a hairdresser, a laundry service, a restaurant and bar. Its spectacular setting, luxurious design, and outstanding service make this a truly special hotel. This elegant hotel features 144 rooms exclusively decorated for the most discriminative travelers, with stunning views of the gardens and mountains. Los Sauces Casa Patagonica is a lavish lodge idyllically situated on four acres of immaculate lush gardens. The crackling log fires, rough stone walls, and exquisite Argentine paintings and sculptures decorate this cottage-like retreat with a quaint charm that will make you feel right at home. There are 38 guest suites which vary in size and opulence, but all boast cozy classical furnishings, thoughtful artistic touches, and splendid mountain views. The hotel’s library, observatory, 9-hole golf course, sumptuous spa and Patagonia-inspired gourmet cuisine are just some of the details that make Los Sauces exceptional. Ideally located at the entrance of the city of El Calafate this charming hotel provides for easy access to the airport as well as to the magnificent Glaciares National Park. It’s also only a few blocks from the city center and all the surrounding attractions. With its rustic architecture and interior, the hotel beautifully represents the spirit of Patagonia, with a touch of modernity to ensure guests’ maximum comfort. The 48 spacious rooms are cozy and inviting, decorated with wooden furniture and warm colors. The internationally renowned Llao Llao Hotel & Resort is one of the finest hotels in Latin America, as much for its magnificent location as for its sumptuous, elegant interiors and refined service. Situated on the Llao Llao Peninsula, the hotel was built in 1938, and features 159 comfortable and tastefully decorated rooms. The spa offers views that are nothing less than panoramic, with treatment rooms affording breathtaking lake and mountain vistas. The hotel's exquisite restaurant, Los Cesares, is the best in the Bariloche area, and the business center has free Internet access available for registered guests. Among the facilities of this luxurious accommodation you will find a heated swimming pool, bar, lounge, golf course, tennis courts, gym, spa, children’s center, and shopping arcade, to name only a few. Patagonian-chic is what you’ll find at the Design Suites Hotel in Bariloche. Although the interiors and exteriors of the hotel are made up of local woods and stones, there’s nothing rustic about this exceptionally modern lodging. All 60 suites have floor-to-ceiling windows which provide breathtaking views of Lago Argentino. Spacious and comfortable, the suites offer internet access, a fully-equipped kitchenette and a flat-screen TV, among other amenities. The hotel itself boasts an on-site gym, heated swimming pool for dipping during the winter and an art gallery. Travelers looking to sample some of Argentina’s culinary delights will love this tour, which combines stunning scenery with delicious treats. You will first head to Cerro Campanario, named by National Geographic as one of the top 10 views in the world. Enjoy the snow capped peaks of the Andes towering over glistening blue lakes and green landscapes while you taste some of Bariloche’s famous chocolate. Your tour will continue by bus to the Llao Llao Municipal Forest, where you will disembark and go on a two-hour guided walking tour to reach a hidden lake. You will also visit the Craft Beer Factory Gilbert, and will end the day with a visit to a former Swiss colony before returning to your Bariloche hotel. This full-day tour of Bariloche area is ideal for travelers who want to explore the region in depth. The route will take you past the rivers, creeks, and mountains that define this area. Along the way you will see the Enchanted Valley with its strange rock formations and travel through the beautiful forest around the Traful Lake before visiting the town of Traful. Nearby, there is a fantastic view of the lake that you can admire from a 334-foot high glacier cliff. You will pass Puerto Arrayán, Portezuelo, Quintupuray, Correntoso, Puerto Manzano, and the Huemul Peninsula, skirting the lake as you travel. After the tour, you will be taken back to your hotel in Bariloche. Mount Tronador boasts three impressive peaks: Argentino at 11,187 feet (3,409 meters), International at 11,660 feet (3,653 meters), and Chilean at 11,253 feet (3,429 meters). This scenic tour will take you to the bases of these three peaks as well as to the nearby Black Glacier. The tour leaves from Bariloche and passes a number of lakes on the route to Tronador. You will cross the valley of the Vuriloches before arriving at the Black Glacier and the foot of Tronador. From here you can walk to the glacier for views of the white snow capped mountains that surround the area. On this tour you will visit the world famous 60-year-old ski resort town of Cerro Catedral, the hub of South American mountain adventures. The tour will depart from your hotel in Bariloche and take you by mini-bus to the resort, located just 12 miles away. From here, you take the chair lift up to nearly 10,500 feet (3,200 meters) for fantastic views at the summit. There is a cafe at the top so you can sip a hot cup of cocoa or coffee while you enjoy the spectacular views. This tour takes you by boat to the lovely Island of Victoria. The island used to be a conifer nursery and is still full of leafy paths and verdant foliage. Once you arrive on the island, you will take the chairlift up to 2,952 feet (899 meters) to the summit of Mount Bella Vista, which offers stunning views from its peak. From the mountains you will head to Puerto Quetrihue and the world famous Bosque de Arrayanes, where ancient specimens of white flowered trees bear delicious purple fruits. From here you can explore some of the trails independently before returning to your hotel in Bariloche. The area around Puerto Blest has a lush landscape resembling the classic Norwegian Fjords. From your Bariloche hotel, a bus will take you to the port where you will board a boat for your journey past Sentinel Island. You will then disembark at Puerto Blest and take a bus to the nearby Lake Frias where you will take another boat tour around this stunning area. You will then return to Puerto Blest by bus and embark on the crossing to Cascada los Cántaros. You can admire the remarkable beauty of the local waterfalls, considered one of the most beautiful excursions in the area. For those combining an Argentina tour with other destinations in South America, a lake crossing from Argentina into Chile is one of the most beautiful and unique ways to continue your trip in style. On this adventurous lake excursion, you will sail through three splendid Andean mountain lakes. From the deck of the cruise ship, you will be treated to spectacular views of lakes, as well as glimpses of the volcanoes Calbuco, Osorno, and Tronador; the towering Cerro Catedral; and the beautiful national parks of Patagonia in Chile and Argentina. The cruise operates year-round, departing from Bariloche, Argentina. Along your adventure, you will stop to cross the border between Argentina and Chile. You will also stop at a number of places en route where you can enjoy lunch or even spend the night in remote bliss. You can stay in Petrohue in Chile, which is near the beautiful Vicente Perez National Park and the imposing Petrohue Falls, or relax in Peulla in Chile or Puerto Blest in Argentina. From Puerto Montt in Chile, you can return to Bariloche, or continue onward to your next destination. This full day boat cruise and mini-trekking experience begins at the Bajo de las Sombras dock, where you will board a cruise ship for a short boat ride to the southern edge of Lago Rico. You will disembark on the glacier-side of the lake, where mountain guides will welcome and brief you on the park rules and trekking safety. Groups of maximum 20 trekkers will set out for the glacier, and at the edge, trekkers will put on their crampons before enjoying a 2-hour glacier walk. On the way back, you will stop at the glacier’s balconies for spectacular panoramic views of the entire glacier. Back at the shelter you will stop for lunch (not included), before returning by boat to Bajo de las Sombras, and from there to your El Calafate hotel. Due to insurance reasons beyond the control of Argentina For Less, participation in this excursion is limited to travelers between 10 and 65 years old. Several hours of walking through diverse terrain requires both good physical shape and a sense of adventure. Wear sports clothing (sweaters, rain jacket, sunglasses, trekking shoes or tennis shoes, and gloves) and bring UV sun block, a small backpack, and water bottle. It is recommended to bring your own boxed lunch, which can be prepared at your hotel upon request. Meet your guide for your journey to Punta Bandera, where you will board a ship and cruise along Lago Argentino past drifting icebergs to the Upsala Glacier. You will continue on to Onelli Bay, where you will disembark at the port and take a short trek to Onelli Lagoon. At this remarkable lagoon the glaciers Onelli, Bolados, and Agassiz converge. Afterward, you will set sail again, this time passing the Spegazzini and Seco glaciers, before returning to the El Calafate port in the late afternoon. Please note that due to sudden shifts in weather, the precise nature of this cruise can change. At times alternative glaciers and/or routes may be required. On this full day Big Ice trekking adventure, you will hike into the heart of the immense, awe-inspiring Perito Moreno Glacier. You will first take a short boat cruise along Lago Rico to the glacier side of the lake, where guides will welcome you. After a safety and equipment briefing, you will walk to the foot of the glacier, get outfitted in your crampons, and head into the icy blue wilderness. An hour’s trek will take you to a breathtaking view of the immense ice plateau, where you will be able to enjoy lunch and rest before heading back to terra firma. The hike lasts about 3 hours, with expert guides leading you every step of the way and sharing their knowledge of the glacier and the area with you. Another 1-hour hike will take you back to boat returning to El Calafate. Due to insurance reasons beyond the control ofArgentina For Less, participation in this excursion is limited to travelers between 18 and 45 years old. Several hours of walking through diverse terrain requires both good physical shape and a sense of adventure. Wear sports clothing (sweaters, rain jacket, sunglasses, trekking shoes or tennis shoes, and gloves) and bring UV sunblock, a 40-liter backpack, and water bottle. The park entrance fee, lunch, and clothing are not included.It is recommended to bring your own boxed lunch, which can be prepared at your hotel upon request. Also available are several half day excursion options to the nearby Cerro Frías Mountain. You can choose a guided horseback riding adventure, a trekking tour, or a 4x4 excursion. Cerro Frías has well-marked paths and panoramic views of Torres del Paine, Monte Fitz Roy, and Lago Argentino, making it a popular choice for day trippers. All tours are suitable for any age group. This full day excursion takes you by boat to Los Glaciares National Park and the Upsala Glacier. You will start the day with a drive to Puerto Bandera, a town roughly 24 miles from Calafate, where you’ll board a sleek, modern boat and start your journey across the sparkling Lago Argentino and up the breathtakingly beautiful Cristina Canal. You will sail amidst stunning scenery, passing icebergs and the impressive western front of the Upsala Glacier along the way. Shortly before noon, you’ll arrive at Estancia Cristina, a rugged wonderland of more than 54,300 acres of grassland, mountains, and glaciers. Your estancia experience will depend on your choice of excursion: trekking, walking, or four-wheeling. You can choose to do this excursion with lunch prepared at the estancia or enjoy a packed lunch (not included). You will head back to El Calafate in the late afternoon. You’ll start your half day 4x4 adventure in Calafate. You will drive from town to Huyliche Hill, where you will gradually ascend to 3,280 feet (1,000 meters) above sea level. From the top of the hill you’ll have spectacular views of Calafate, as well as Lago Argentina, Mount Chalten, and the Perito Moreno Glacier. You’ll also see interesting rock and fossil formations. You’ll navigate an exciting and steep ride back down the hill and, upon arrival to El Calafate, will be taken to your hotel. This 1-hour long whale watching cruise departs from Puerto Pirámides and is an excellent complement to the Peninsula Valdes excursion. The tour begins along the coast, giving you an opportunity to spot sea lions, elephant seals, and penguins. Then, you’ll head out to sea where you may see dolphins, orcas, and of course, the highlight of the tour, southern right whales. If you’re lucky, you’ll glimpse whales cavorting, breaching, lobtailing, and spyhopping. Peninsula Valdes has the largest population of southern right whales and they often come within 700 feet of the shore. Price does not include transfers. This full-day Punta Tombo tour takes you to the largest reserve of Magellan penguins in the continent. You’ll leave early in the morning and drive 75 miles (120 km). You’ll arrive at the Punto Tombo Provincial Reserve, where you’ll spend the day surrounded by more than 200,000 penguins. During your two-hour walking tour, your guide will explain the behavior of these fascinating flightless birds, including their mating and migratory patterns. You will end the day by visiting the Welsh-influenced town of Gaiman, where you can taste typical Welsh tea and choose from the delicious variety of cakes and homemade candies. You may also visit the city of Trelew, where you can tour the interesting Egidio Feruglio Paleontology Museum. Tours of Punto Tombo Provincial Reserve are available from September to April. Prices do not include entrance fees or food. This half day tour along the Chubut river valley takes you along the path Welsh settlers once took, making it an ideal way to learn about the influence of these pioneers. Departing from Puerto Madryn mid-day, you will first head to Florentino Ameguino Dam to explore this feat of engineering that produces much of the region’s energy. You’ll visit Dolavon, the quaint village that grew around the Chubut valley’s first flour mill. Learn all about the mill and the nearby observation point, which the indigenous Tehuelche people may have used for astronomical observations. Passing small, family-owned ostrich and sheep farms, you’ll stop to see the highlights of the area, including the Welsh church of Saint David Anglican, and a small typical farm. This half day sea kayak expedition takes you approximately 2.5 miles (4 km) along the beautiful coastline of Gulfo Nuevo. Geared toward nature lovers, this excursion includes an in-depth discussion about all the flora and fauna of the land and sea around Gulfo Nuevo. For those who have never been kayaking, including children, this is a terrific experience. The waters of Gulfo Nuevo are calm, and the wildlife watching is superb. Glide along the gulf, and enjoy the sun, sights, and sea. This tour is available year-round and includes the kayak and oars, gloves, life jacket, waterproof bags, and lunch. Puerto Madryn is considered the diving capital of Argentina and is visited year-round by local and international divers attracted to its clear waters and varied sea-fauna. On this Puerto Madryn tour, you will meet your professional scuba diving instructor who will brief you on scuba diving safety measures. You will travel to the Golfo Nuevo where your instructor will give you a scuba diving baptism, a beginner’s plunge into the water. You’ll submerge about 16 feet (5 meters) with your instructor and discover the colorful and diverse submarine flora and fauna such as snails, starfish, seaweed, coral, and sea anemones. The length of the tour is about two hours. No previous experience is needed and beginner swimmers are welcome.